Bailey Word merged his two businesses with Rich & Cartmill, Inc. in 1991, and was named as a Vice President and stockholder in 1993. He was named president, January 2005 and served through January, 2008. Prior to the merger, he was president of Kramer-Word and Associates, Inc. in Tulsa from 1980, and Broadway Insurance Agency, Sand Springs from 1985. Bailey received his designations for CLU in 1974 and CIC in 1985. He has been president of the Tulsa Association of Life Underwriters on two occasions and president of Utica Square Kiwanis Club. 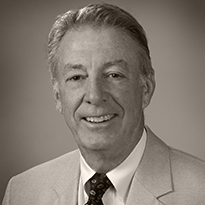 Bailey was a member of the Board of Directors for the Independent Insurance Agents of Greater Tulsa from 1998-2002. He also served as their President from 2001-2002. Bailey is also a former member of the Board of Directors for the Tulsa Country Club. Bailey attended the University of Oklahoma and graduated from Westminster College in Fulton, Mo. with a degree in Business Administration. He and his wife attend Boston Avenue Methodist Church.